Lt. Colonel Robert H Stumpf, 3rd Battalion, 39th Infantry Regiment, 9th Infantry Division. Robert Henry Stumpf was born on September 1st, 1915 in Barberton, Ohio. His father, Elmer Robert Stumpf, was a physician specializing in heart disease. His mother, Anne Moore Stumpf, and father were both originally from Festus, Missouri. At Barberton High School, Bob excelled in mathematics and science, and was a football letterman. After high school graduation in 1932, Bob attended Akron University for one year while competing for an appointment to the United States Military Academy at West Point, New York. Having received a presidential appointment, Bob reported to West Point in July 1933 with the class of 1937. He was a large man at six feet four inches tall, who is remembered by his classmates for his robust health and good nature. He played football and boxed at the academy, earning the nickname “Primo” after his striking resemblance to the then world heavyweight champion, Primo Carnera of Italy. One of Cadet Stumpf’s infantry tactics instructors was Major Omar Bradley who is said to have made the subject come alive for the cadets. Cadet Stumpf’s proclivity in mathematics and science prepared him well for the rigid engineering curriculum at West Point. Although not among the top cadets, he never faltered academically, finishing 141st out of 298 in his graduating class. He was commissioned a second lieutenant of infantry in June 1937. Lt. Stumpf chose to pursue flight training with the Army Air Corps and reported to Randolph Field, San Antonio, Texas in August of 1937. After several months of flight training without completing the course, he transferred back to the infantry and was assigned as a platoon commander with the 6th Infantry at Jefferson Barracks, Missouri. There, in the fall of 1938, he met a 19-year-old student at Lindenwood College, Imogene “Jerry” Stroh. They were married the following June at Ft. Benning, Georgia. Jerry’s father was Major Donald Stroh, the chairman of the attack committee at the Infantry School. In pursuit of an Army sponsored masters degree at Massachusetts Institute of Technology, Lt. Stumpf transferred to the Ordnance Corps in the summer of 1940. The Stumpfs packed up and moved to Aberdeen Proving Grounds at Havre-de-Grace, Maryland where Lt. Stumpf attended the Army Ordnance School learning weapons theory and production. In August 1941, they moved to Cambridge, Massachusetts to begin the degree program. But before starting classes, due to looming wartime contingencies, the program was cancelled. Capt. Stumpf was then assigned to the Watertown Arsenal in Boston where he helped supervise the building and testing of new Army weaponry. In early 1942, Capt. Stumpf attended the short staff officer’s course at Ft. Leavenworth, Kansas, was promoted to Major, and transferred to the staff of the 76th Infantry Division. As plans for the invasion of North Africa began to coalesce, Maj. Stumpf was assigned as the assistant ordnance officer of the Western Task Force under Major General George Patton. He shipped out with the task force from Norfolk, Virginia, in October 1942 bound for French Morocco. Also in the invasion task force were elements of the 9th Infantry Division whose assistant commanding general was his father-in-law, now Brigadier General Stroh. Mrs. Stumpf and Mrs. Stroh moved to Washington, DC for the duration. Maj. Stumpf landed with the initial assault on D-day, November 8th at Fedala, near Casablanca, the capital of French Morocco. After two days of fighting, Patton’s forces had captured the city and he set up headquarters at a downtown hotel. During the assault, five ships of the invasion force were sunk by German U-boats, including the one containing all Maj. Stumpf’s personal belongings. Lt. Colonel Robert H Stumpf, AAA-O helmet markings crossed out. 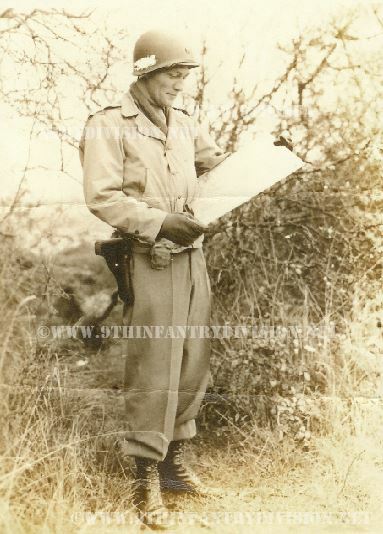 Finding himself unsatisfied with staff duty, Maj. Stumpf was granted a transfer to the 66th Armored Regiment of the 2nd Armored Division, then deployed to the northern part of French Morocco against a contingency that Spain would enter the war on the side of the Axis. He was assigned as the regiment’s executive officer. In May and June 1943 he commanded the Second Battalion of the 66th while the former commander took over the Regiment temporarily. Also in May, he was promoted to Lieutenant Colonel. After the return to the battalion of the former commander, he was selected as the executive officer of the 2nd Armored Division’s Task Force A under Brigadier General Maurice Rose for the invasion of Sicily. Lt. Col. Stumpf landed with the initial assault at Licotta on the southern coast of Sicily on July 10th, 1943. This time his landing craft was bombed, strafed and sunk by the Luftwaffe. He made it to the beach without being wounded, but again, lost all his personal belongings. Task Force A played a pivotal role in conquering the island as it maneuvered north to capture Palermo. At the conclusion of the fighting, Stumpf accepted command of the Third Battalion of 39th Infantry Regiment under the legendary Col. Harry “Paddy” Flint, ironically a former commander of the 66th Armored. The 39th was one of three infantry regiments in the 9th Infantry Division. After an extensive training period, the 9th Infantry Division shipped out to England in late November 1943. During the preparations for the invasion of France, the Battalion was bivouacked at Barton Stacey, near Winchester, but spent much of the time training in the field. Lt. Col. Stumpf used his combat experience from the North African and Sicilian campaigns to best train his troops for extended combat operations. 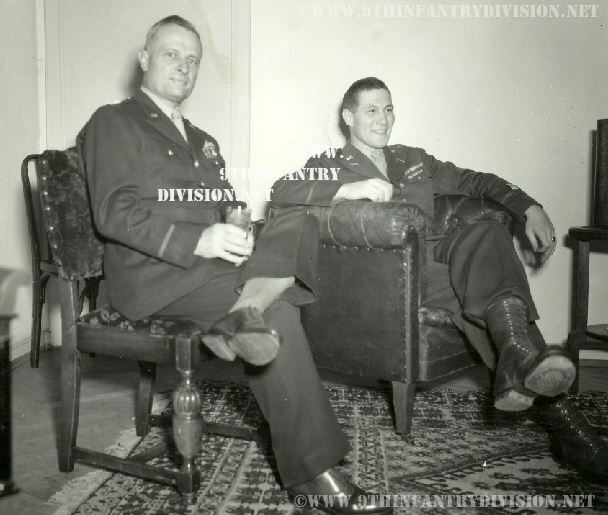 During leaves, he was able to spend some time in England with his father-in-law and also his brother-in-law, Lt. Harry Stroh, an Army Air Corps fighter pilot serving in the Ninth Air Force. Lieutenant Colonel Stumpf led his Battalion ashore at Utah Beach in Normandy on June 10th, 1944, still under fire from enemy coastal batteries in the vicinity of Quineville. The 39th was given the mission of reducing these batteries and other German defenses in the vicinity. On June 14th, Col. Stumpf’s Third Battalion was assigned to capture the town of Quineville and the coastal defenses there. 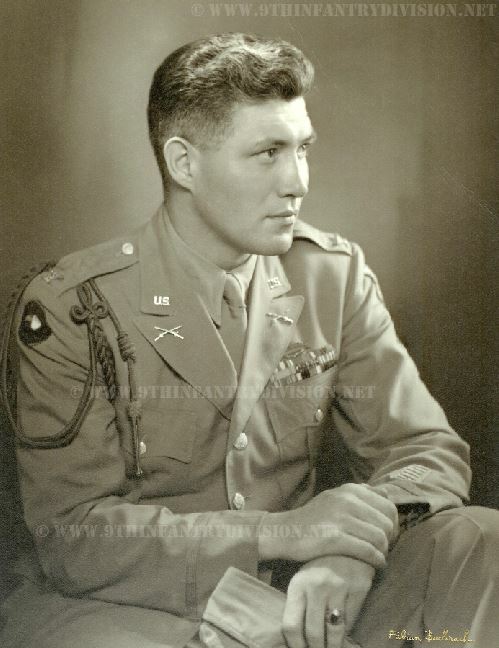 He led the Battalion under heavy fire and succeeded in capturing the town and silencing the guns, thus overcoming the last German opposition directed against Utah Beach. For this action he was awarded the Bronze Star medal for heroism. The Battalion rejoined the 9th Infantry Division for the drive west across the Cotentin Peninsula, then northward towards the strategic port of Cherbourg. The battalion was in continuous action until the capture of Cherbourg in late June. On the night of June 30th, Col. Stumpf led his reinforced battalion in mopping up the last German pockets of resistance in the northwest corner of the Peninsula, including the capture of 1100 German soldiers. For this action he was awarded another Bronze Star. A few days later, Col. Stumpf led his Battalion against a determined attack by the German Panzer Lehr Division in the vicinity of Carentan. During the confused combat that followed, he organized bazooka teams to hunt down and destroy individual tanks, eventually leading to the repulsion of the German attack and the resumption of the Allied offensive. With the 9th Division, Col. Stumpf’s Battalion participated in the breakout battle at St. Lo, the drive across Northern France and subsequent operations in Belgium. For leading his Battalion on a night crossing of the Meuse River under heavy enemy fire in September, Col. Stumpf was awarded the Silver Star medal for gallantry. In September 1944, the Battalion began initial operations against the Siegfried line in the vicinity of the Huertgen Forest. This brutal and prolonged combat persisted against determined German resistance until February 1945. At the Battle of the Bulge in December 1944, Col. Stumpf’s Battalion with the rest of the 9th Infantry Division successfully held the northern flank of the German breakthrough. In January, the division participated in the offensive to capture the Roer River dams, thus denying key strategic assets to the enemy. Col. Stumpf was asked in February 1944 to take command of the 424th Infantry, at that time the only remaining regiment of the 106th Infantry Division, which had borne the brunt of the Germans’ initial onslaught at the Bulge. He was reluctant to accept, as the new commanding general of the division was none other than his father-in-law. Gen. Stroh convinced him of the regiment’s dire need for strong leadership and the challenge of rebuilding its confidence for renewed action against the enemy. Col. Stumpf accepted. The 424th was then engaged along the Siegfried Line, opposed by the bulk of the 26th German Division. During the next month of combat, the 26th was reduced to the extent that it ceased to exist. Col. Stumpf led his regiment in following the withdrawal of the German forces marking the start of the last great American offensive in the European Theater. From March 15th until the middle of April, the regiment withdrew to France for retraining and rehabilitation. On April 24th the 424th was quickly redeployed to Germany for the task of guarding and administering more that 300,000 German prisoners of war in seven large enclosures. For the next several months, reinforced with an additional 4000 troops, Col. Stumpf led the regiment in a variety of POW and occupation duties, including the disarming and repatriation of hundreds of thousands of German soldiers. He was promoted to full Colonel in June. He was awarded the Legion of Merit for his command service from September 1943 to June 1945. The 106th Infantry Division returned to the United States in August and September 1945. Col. Stumpf was repatriated with his wife in Washington on September 1st, his thirtieth birthday, after almost three years of nearly continuous combat duty. After the war, Col. Stumpf served in a variety of Army positions. Following graduate school at University of Southern California, he was stationed at White Sands, New Mexico during the genesis of the Army’s guided missile program. Later he was an instructor at the Command and General Staff College, a senior liaison officer with the Canadian Armed Forces, a student at the Army War College, a staff officer for the Chairman of the Joints Chiefs of Staff, and a senior advisor to the South Korean Army. In 1961 he assumed command of the Virginia Sector of the 21st U. S. Army Corps. He retired from the army in 1967 and died in 1971. Col. Stumpf is survived by his widow, Imogene Stroh Stumpf of Atlantic Beach, Florida, three sons, and five grandchildren, and three great-grandchildren. A special thank you goes out to Colonel Stumpf’s son Bob, who provided me so many great details about his father.